Bespoke website for high profile public realm schemes in East London. High Street 2012 is an ambitious project to enhance an area of East London, between the City of London and the Olympic site in Stratford. The project consists of a number of interlinked public realm schemes and street enhancements that cover the study area to create a coherent, unifying link. 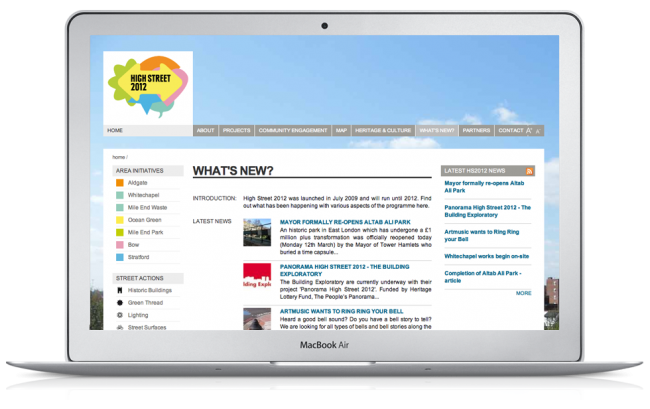 We were commissioned by the High Street 2012 partners, led by London Borough of Tower Hamlets to create a bespoke website to provide information to the public about the various schemes. A primary role for the website was to allow the local community to have access to the latest project information, and to easily find information about how they could be involved in the process. Before the website existed, information about the projects was dispersed across the internet, at a variety of different locations. The new website was to unify these sources, becoming the single point of reference for the project. Throughout the project, the design team was in regular contact with the delivery partners to ensure consensus on the way forward. With such a large number of stakeholders, this approach is vital to ensure longer-term support for the project. Following the establishment of a clear specification for the site, a series of wireframes and design mockups were created. From here, a shortlist of preferred designs was established, and a preferred option selected. The site was formed using a content management system, with a custom theme developed using PHP and CSS. Government requirements for accessibility are reflected throughout the design. Various media elements have been embedded within the site, with image galleries available, in addition to an interactive Google Map developed specifically for this project. Following a presentation of the finished website to project stakeholders, including one of London’s governmental design organisations, the site was released to the public. Since then, it has continued to act as a noticeboard for the latest project developments. Now that most of the schemes are under construction, it is our hope that the website will continue to be a valuable asset to assist in the promotion of this and similar schemes moving forward. This work was undertaken on behalf of JMP Consultants Ltd.
"Myself and the High Street 2012 partners worked really well with BrightPie in developing our much-needed website. They were always friendly, efficient and quick to respond to changes. They were easily able to understand the multi-layered nature of the funding partnership, helping to ensure all partners were satisfied with the outputs. We are very pleased with the final result, which is easy to update, and it helps us keep in touch with the public about the project as each different part of it progresses."